This research paper outlines the summary of the key components of a research study that examined earnings management by analyzing the effect of external and internal corporate governance mechanisms on earnings management with an emphasis on external factors. The focus on corporate governance has been emphasized over the past decade by the activities of predators, through corporate collapses, and by previously unimaginable strategic developments. This research study is outlined as follows: research questions and hypotheses, comprehensive description of survey methodology, data collection, and sampling design. The research highlights the process of how the study was conducted as well as the purpose and importance of the research. 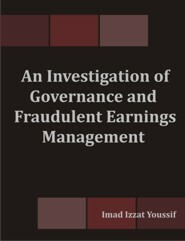 Dr. Imad Youssif has worked in the investigative, accounting, and financial fields since 1985. With his passion for investigative work, he has concentrated his efforts by working nearly exclusively on forensic accounting assignments since 2006 when he launched his own consulting business, Forensic Accounting Consulting.